"Halo" redirects here. For other uses, see Halo (disambiguation). The Array at Installation 00, just before their departure to firing sites across the galaxy. "Halo doesn't kill Flood, it kills their food! Humans, Covenant, whatever—we're all equally edible! The only way to stop the Flood is to starve them to death. And that's exactly what Halo is designed to do: wipe the galaxy clean of all sentient life!" — Cortana during the Battle of Installation 04. The Halo Array, sometimes known simply as Halo or the Array, is a network of colossal ring-shaped superweapons individually known as Halos or Halo rings, constructed by the Forerunners. The Halos were referred to by the Covenant as the Sacred Rings, and labeled Fortress Worlds and Installations by the Forerunners and their monitors. The first array of twelve Halos was constructed by order of Master Builder Faber circa 98,445 BCE with the intent of being an ultimate weapon, one that would secure the preeminence of the Builder rate in Forerunner society. Later, the weapons would be refined further and a new array of six smaller and significantly more lethal installations was constructed; the newer Halos are known as the "neoteric" rings. Eventually, eleven were destroyed and/or lost while the remaining seven were used by the Forerunners as a last resort when combating the parasitic Flood. All sentient beings in the galaxy were killed, robbing the Flood of hosts and starving it to death. In addition to serving as weapons of last resort, Halo installations are also research facilities dedicated to containing and studying many different kinds of life forms. The life forms that were hand-selected by the Librarian included marine life, fauna, and land vertebrates. With the Master Builder's permission, the Librarian would research each animal to detect if their bodies reacted to Flood infection. The research on the animals would be more deeply analyzed if they did become infected. The Librarian's studies also helped determine if the rings could be used to repopulate the galaxy as part of the Conservation Measure. A section of a Halo's surface. As it is known in modern times, the Halo Array is a network of seven ring-shaped megastructures created by the Forerunners, designed to exterminate all sentient life within the Milky Way galaxy. Built following the Human-Forerunner War, these ringworlds were later used as a last resort against the Flood, a parasitic extra-galactic species that threatened to consume every sentient life-form in the galaxy. By activating the rings, the Forerunners wiped out every sentient being in the galaxy, effectively starving the Flood to virtual extinction, though specimens were kept in a number of Forerunner containment facilities, including the Halo installations themselves. A total of eighteen Halo rings existed during the reign of the Forerunners; an older array of twelve 30,000-kilometer-wide rings produced by the greater Ark and six 10,000-kilometer rings, constructed at the newer lesser Ark. Of these, only seven survived to be included in the final Array. The Halos were originally deployed in orbit over large gas giants. However, as of 2557, Installation 03 orbited a rocky planet. Installation 04 maintained an atmospheric mining facility in its anchor planet Threshold's atmosphere until it was destroyed by the Covenant. Though separated by thousands of light-years, the installations are networked together and capable of remote activation at the Ark, their extragalactic construction foundry. Each Halo installation has a maximum effective range of 25,000 light-years in every direction. The method utilized by the array to conduct this "mass sterilization protocol" involves the superluminal conveyance of a burst of cross-phased super-massive neutrinos, tuned to emit a harmonic frequency that destroys the nervous system of any life form within range. Simpler organisms lacking a neural system are unaffected, along with inanimate structures. Precursor technology, however, is extremely susceptible to damage from the Halo effect due to its quasi-living neural physics composition. Readout of the seven Halos. The Halo Array in its entirety has been fired only once in known history, approximately 100,000 years ago, by the IsoDidact in order to stop the Flood from overwhelming the galaxy. All beings in the Array's effective range, including Forerunners themselves, were wiped out by the Array's pulse, with the exception of those who took refuge on the shield worlds. A number of Forerunners survived at the lesser Ark but chose to exile themselves from the galaxy. The array has come close to activation four times since; Installation 04 was almost activated by the Master Chief, Installation 05 was activated by Commander Miranda Keyes at the behest of the Jiralhanae Chieftain Tartarus, Sergeant Johnson was forced by the Prophet of Truth to activate the Array from the Ark, and Bobby Kodiak was forced by 000 Tragic Solitude, the Monitor of the Ark, to activate the Halo Array from the Ark as a revenge. None of these attempts were successful; the first was stopped by Cortana, while the other three attempts were halted by UNSC and Sangheili intervention. A replacement Halo for the destroyed Installation 04 was successfully activated outside of the galaxy, eliminating the Flood massed at Installation 00, but it was incomplete and thus not networked to the rest of the Array. Each of the Halo installations manufactured at Installation 00 is given a sequential designation number based on their order of construction, beginning from 01, and is overseen by a single monitor. The monitors are given control of the Installations' Sentinel automatons, from Aggressors to Constructors and Enforcers, and are responsible for containing the Flood test subjects in their research facilities and protecting the Halo from intruders. The Array also encompasses Installation 00, an extragalactic construction facility that can create replacement installations in the event that one is destroyed. 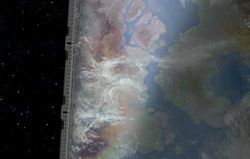 All Halos can also be remotely activated from the Ark without being subjected to their effects, as the megastructure is out of the Array's range. The Forerunners also built shield worlds as a means to escape the effect without having to leave the galaxy. A Forerunner observes the construction of a Halo. The first Halos were constructed by the Master Builder Faber and his Builders in the millennia after the Flood was first encountered in the Milky Way, only to eventually retreat, seemingly due to early humanity's efforts. The most extreme faction of Builders, which at the time controlled the Ecumene Council, claimed that more extreme measures should be used to protect the galaxy against a possible Flood resurgence and proposed building the Array for this purpose. The initial iterations of the weapon system that would eventually become Halo did not share the circular shape of the final installations. Although they faced strong opposition from the Prometheans, led by the Didact, for thousands of years, the faction eventually won the approval of the Council and commenced work on the Array. Several prototypes of the Halos were constructed and powered by their host facilities, with one such installation orbiting a rogue planet. However, at this point, the Librarian went to the Council and invoked the Mantle, stating that the Halos should be used as biological preserves in the Conservation Measure, a plan to repopulate the galaxy should the Array ever be activated. The Council approved her request, and ordered that the Halo installations be constructed to have a range of natural environments for the Lifeworkers to preserve their biological specimens in. The Builders also agreed, seeing the inclusion of biological preserves as an effective means of competing with the Didact's shield worlds which incorporated similar measures. However, the Master Builder later altered the initial plan, and his researchers began to use these specimens for a series of brutal experiments involving Flood infection. Twelve Halos, each 30,000 kilometers in diameter, were originally commissioned by Master Builder Faber and constructed by the guild of Bornstellar's father at the greater Ark, the first Ark installation to be constructed. Only one of these original rings ultimately survived to be used in the Forerunners' final plan; this ring was designated Installation 07. Later on, an improved, separate array of six installations was constructed at the lesser Ark, although the construction of the second Ark and its more powerful Halos was delayed by the Council for some time to prevent the Builders from becoming too powerful. In the later stages of the construction of the first Halos, a Builder named Maker-of-Moons was assigned to improve upon their designs. The first test deployments had proven the original rings to be unstable and too large to be practically deployed, generating enormous particle reconciliation debt when moved. The original Ark also had several flaws, including the inability to construct smaller installations. Although initially reluctant to admit these defects, the Master Builder, informed by Maker's analysis, commissioned a new Ark and a series of new, more efficient rings several millennia after the first Halos were made; the Builders promoted this as a means to save even more species while being able to create more Halos. The new Ark, known as the lesser Ark or Installation 00, and its six new Halos were constructed in secret, their location known only to the Master Builder. The final Array, activated at the conclusion of the Forerunners' conflict with the Flood, was comprised of seven rings, each 10,000 kilometers in diameter, one of them being the reduced Installation 07. The original Halos gathered in orbit around Maethrillian. The first test of a Halo installation was conducted by Mendicant Bias, who fired Installation 07 in the system of Charum Hakkor and Faun Hakkor on a low power setting, destroying all of the sentient life on the latter planet and inadvertently releasing the Primordial, an extant Precursor entity, from captivity on the former planet. Mendicant Bias then brought the released being to the Halo for study and began a 43-year-long interrogation of it. Eventually, Mendicant Bias disappeared with Installation 07 after being corrupted by the Primordial. 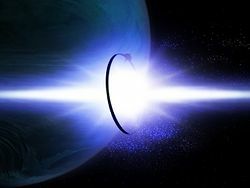 Following the use of a second Halo by Master Builder Faber to suppress a rebellion on the San'Shyuum homeworld of Janjur Qom, the other eleven Halo installations were taken to the Forerunner Capital during the tribunal against Faber, where it was to be decided whether to decommission them. However, in the midst of the trial, Mendicant Bias, turned rampant by the Primordial, appeared with Installation 07, which had gone missing following the ancilla's corruption and assaulted the Capital. The AI attempted to seize control of the remaining Halos and fire them, but was only able to control five out of the twelve. One of those five was destroyed by the combined tidal forces of the Capital, the firepower of local Forerunner fleets, and the stress of a recent slipspace transition. The seven Halos that Mendicant Bias was unable to control were recalled to Installation 00 via a slipspace portal, yet only one escaped before the portal collapsed, with the other six breaking up in slipspace. Installation 07 jumped into a distant system on a pre-designated destructive collision course with a planet—a security measure put in place in the event that it fell out of Forerunner control. The installation was eventually reclaimed by the IsoDidact's forces, and it survived the passage of the planet despite taking heavy damage. A significant amount of the ring's superstructure was discarded, reducing its size to 10,000 kilometers, in order to allow it to perform a successful slipspace jump to the greater Ark. The installation's surviving biological specimens were transported on the Ark and the Flood outbreak on the ring was contained. The ring was refitted to enable it to function in concert with the six final Halos and deployed to its final station in the galaxy; the distribution of the final Halo Array would follow several years later. During the battle at the Capital and the years that followed, all but one of the original twelve rings—Omega Halo—apart from the repurposed Installation 07 were hunted down and destroyed by the Flood. In the final hours of the Forerunner-Flood war, the ecumene's leadership retreated to the greater Ark, also home to Omega Halo. When a Flood attack became imminent, it was decided that the IsoDidact go to the lesser Ark where he would deploy and fire the final Halo Array. Before relinquishing the coordinates to his secret Ark, the Master Builder met the IsoDidact in the control room of Omega Halo and fired the ring, obliterating a small portion of the star roads laying siege on the Ark and cleansing the Large Magellanic Cloud of life. The Halo Array fires, ending the conflict. 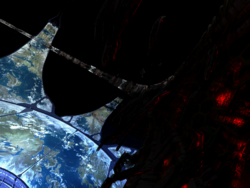 The Flood and the star roads destroyed both Omega Halo and the greater Ark, but the IsoDidact managed to escape to Installation 00 to fulfill his mission. 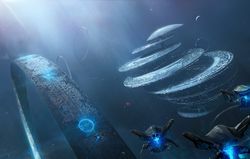 Arriving at the lesser Ark, the IsoDidact had the rings' Index collection distributed to their respective installations aboard a Lifeworker vessel over the Ark. The installations' primary monitors were also formally given their assignments to their final posts. Each monitor also received a new name and numeric designation, each intended to serve as a form of memorial to the Forerunners. With the assistance of Offensive Bias, the IsoDidact deployed the remaining six Halos from the Ark's Citadel. Together with Installation 07, these installations comprised the final Halo Array of seven rings. As Mendicant Bias and the Flood prepared their final assault on the lesser Ark in order to stop the firing of the Halos, the IsoDidact activated the Array. Installation 04 was first in the Array to fire, with the others following sequentially as their fields intersected. The pulse covered the entire galaxy, killing all sentient life within range and destroying the Precursors' neural physics architecture, including the Domain the Forerunners used to hold dear. Whether the pulse would destroy star roads and other Precursor artifacts in faster-than-light transit was uncertain even to the Forerunners themselves, due to the largely unknown mechanisms of Precursor superluminal travel. However, their total destruction seems apparent from the fact they were no longer in evidence when the Forerunners repopulated the galaxy. The seven Halos then remained relatively dormant for approximately one hundred thousand years, though at least Installation 05 experienced a major Flood outbreak, while Installation 04 was visited briefly by other species, including a major crash-landing in 40,000 BCE. The Array's activation caused catastrophic damage to ecosystems across the galaxy, with innumerable species both sentient and non-sentient rendered extinct. The dissolving of dead bodies thanks to solute eventually showed up on the fossil record, and was labeled by scientists as the Ross-Ziegler Blip. This curious gap was dismissed as an anomaly caused by spatial distortion until humanity discovered the Array in 2552. Several species indexed by the Library Project did not survive reintroduction to their homeworlds, and those that did were all reverted to a Tier 7 technological state. The mostly uneventful period starting after the firing of the Halos was known as the dark time. The Covenant, a theocratic multispecies alliance, was founded on the misguided belief that the Halo Array was actually the source of a "Divine Wind" that allowed the Forerunners to transcend the physical. By activating the Array, they too could embark on this "Great Journey" and join the Forerunners in godhood. The destruction of Installation 04. 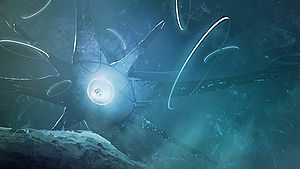 Eventually, the stellar coordinates of Installation 04 were discovered through the combination of a crystal artifact on Sigma Octanus IV and a huge Forerunner artifact buried under the surface of Reach. The coordinates were utilized by the UNSC Pillar of Autumn's shipboard AI Cortana to escape from the Fall of Reach. The cruiser arrived over the Installation's orbit and was subsequently shot down by Covenant ships. Most of the ship's combat personnel escaped and made landfall on the artificial construct, triggering the Battle of Installation 04. During their investigations on Installation 04, the Covenant encountered a Flood containment facility and unknowingly released the dormant Flood; they quickly, but only partially, reestablished containment. Soon, a squad of Marines led by Captain Jacob Keyes accidentally broke quarantine again, expecting to find a large Covenant weapons cache. The human-waged guerrilla war quickly turned into a massive four-way battle between UNSC forces, the Covenant, Sentinels led by 343 Guilty Spark, and the Flood. The partially constructed Installation 08 hovering over the Ark. The battle finally culminated when Spartan John-117 detonated the fusion engines of the Pillar of Autumn on the surface of the installation, which compromised the structural integrity of the ring. The gravitational momentum and inertia still perpetuating the ring in orbit around Threshold then tore the ring apart. The remains of Installation 04 were scattered as debris in space. The explosion sent massive chunks of the ring careening into Basis; the moon suffered a constant bombardment of debris from the ring after its destruction. After escaping the Battle of Tribute, a UNSC freighter, Floral Express, discovered Installation 03 on October 8, 2552. By October 25 neutralization protocols had been established. Later, the Covenant discovered a third Halo, Installation 05. On this Halo, the Flood had already been released and much of the ring had been compromised, including its monitor, 2401 Penitent Tangent. Soon, another four-way conflict began. The battle ended in the Flood manifesting a Gravemind and successfully escaping the ring aboard infected Covenant ships. The ring was nearly activated by Tartarus, the Chieftain of the Jiralhanae, but Commander Miranda Keyes pulled the Activation Index out of the installation's core at the last moment, causing all six functional installations to go into "standby mode", ready for remote activation from the Ark. The human survivors returned to Earth and resumed their fight against the Covenant, who had uncovered a large structure on Earth, which they assumed to be the Ark. The Covenant landed the Forerunner Dreadnought in the center of the structure, activating it. However, the structure was soon revealed not to be the Ark, but a generator of a portal to the actual Ark, a massive artificial world located outside the galaxy. Human and Sangheili forces proceeded through the portal to the newly-discovered installation to prevent the Covenant from activating the remaining Halo rings remotely. Eventually, the Gravemind arrived at the Ark aboard High Charity, the Covenant's capital city, which had been turned into a Flood hive. The hive crashed onto the installation, releasing the Flood. Soon, 343 Guilty Spark, John-117, and Arbiter Thel 'Vadam discovered that the Ark had been constructing a new Installation 04, to replace the one which had previously been destroyed. This new installation was only days from being completed. The humans decided to activate the new ring to stop the Flood, resulting in the incomplete ring destroying itself, severely damaging the Ark in the process. UNSC Infinity approaches a Halo installation. By January 2553, the UNSC had begun an active search for the remaining Halo installations, with the intent to decommission them. By at least July 2557, UNSC scientists were studying the Array for decommissioning, with facilities at Installations 03 and 05. Installation 00 was scouted by both automated probes and the ONI vessel UNSC Rubicon, which was lost several days after its arrival. Installation 07 was discovered in early 2555, with an ONI research group stationed on the ring immediately afterward. A crisis occurred when it was discovered that Installation 07—as well as the other Halos—were counting down to activation in five weeks from March 8, 2555. The activation countdown had been initiated by a human captured by 000 Tragic Solitude, the Ark's rampant monitor. In response to this threat, which was kept highly classified, a joint UNSC-Sangheili detachment embarked on a mission to the damaged Installation 00, as the Ark was believed to be the source of the countdown. Ultimately, the team was able to avert the Halos' activation and the monitor was destroyed. Subsequently, the UNSC began to establish research facilities across the Ark and preparations to repair it by directing Retriever Sentinels to mine lifeless systems. At some point following the loss of Installation 08, Installation 00 began to construct a new replacement, one that would be maintained in the Ark's Foundry in a near-finished state for some time. In February 2556, the Outer Colony world of Sedra suffered a deadly bioweapon attack by a Sangheili terrorist. The bioweapon source was traced to a new element mined from a surviving fragment of Installation 04, created by the supernova-level explosion that had destroyed the original installation. A joint ONI-Sedran Colonial Guard mission was launched to capture the human smugglers mining the element and to destroy the deposits to prevent future use of the bioweapon. Though most of the team was killed, ONI Lieutenant Commander Jameson Locke and Sedran Private Talitha Macer escaped in the smugglers' Bactrian-class freighter while Colonel Randall Aiken sacrificed himself to destroy the deposits and the fragment's resident Lekgolo population with a HAVOK tactical nuclear weapon. Later, the scientists studying Installation 03 located the Composer on the ring and accidentally activated it, causing them to become digitized. However, the sensor data left over from the incident led to the discovery of the shield world Requiem. Later, the Didact traveled to Ivanoff Station near Installation 03 to retrieve the Composer and used the device to harvest the essences of the entire research staff before heading for Earth. Meanwhile, Jul 'Mdama's Covenant faction and their Promethean allies attempted to take control of Installation 03 by using the Conduit to open slipspace portals across the ring, but the attack was repelled by a Spartan Headhunter. The second replacement Halo above the Ark in 2559. A day later, after the Didact's defeat at Earth, the Forerunner and some of his Promethean forces fell on Installation 03 via a slipspace portal. SPARTAN-II Blue Team followed, resulting in a a skirmish fought on both Installation 03 and the Composer's Forge. The Forge's monitor, 859 Static Carillon, transported Installation 03 over the Forge for the Didact, who intended to use the ring to finally destroy humanity. However, the monitor instead allied with the Spartans due to his disagreements with the Didact and helped them defeat the Forerunner. After John-117 disabled the Halo's failsafes, Static Carillon ejected the segment housing the control room, causing it to fall upon the Composer's Forge. The monitor then stabilized the ring and took it to an unknown location for repairs. In late 2558, Installation 00 became a battlefield once again as the mercenary organization known as the Banished arrived there following a sudden shutdown of the Earth portal. The Banished launched an assault on the UNSC bases on the Ark and soon gained control of the entire installation. In May 2559, the UNSC Spirit of Fire, having drifted in space for 28 years, was mysteriously transported to Installation 00 by an agency evidently within the Ark. During the ensuing battle between the UNSC and the occupying Banished forces, Professor Ellen Anders learned of the contingency ring held within the Foundry and was able to launch the new Halo, with the intent of deploying it to Installation 04's former site in the Soell system where a distress beacon could be raised to the UNSC. While the Halo was successfully sent through the portal, its firing mechanism disabled by Professor Anders, the ring was intercepted and forced out of slipspace on the way by a Guardian. The foundational latticework of a Halo installation. The Halos encountered in the modern times are 10,000 kilometers in diameter; this size is roughly similar to that of Earth, which is 12,756km in diameter. While the original twelve Halos had a diameter of 30,000 kilometers, concerns about their structural stability and transport led to the second series of rings being reduced in size. The surface of each ring is 318 kilometers wide, and 22.3 kilometers thick. The main structure of the ring is constructed of a superdense foundational material, with elaborate scaffolding and cantilever structures laid over it to support the artificial landmasses and the myriad tunnel networks and caverns that riddle the installation's internal structure. Many of these tunnels are transit conduits meant for use by the ring's Sentinels, though some of them can be traversed by humanoid beings. The Halo rings achieve their "gravity" through a combination of centripetal force and artificial gravity generators. As the ring spins, centripetal force pushes all spinning bodies away from the center of rotation, though more exotic gravity manipulation is additionally required to achieve the rings' near-Earth gravity. [note 1] The ring is uniform, and because of this, all points are the same distance from the center, therefore centripetal force applies evenly. When the UNSC Pillar of Autumn was detonated, it blasted a large mass from Installation 04; no longer a full loop, the centripetal force applied in much greater strength on the newly formed weak point, causing the ring to rip apart. A section of landmass being ejected from Installation 09. The Halos are capable of repairing themselves to some degree, replacing damaged plates of foundation material and restoring biological sections. Some of the 30,000km-diameter Halos could also be reduced to a smaller size by shedding large portions of the foundation. In order to prevent the ring from falling apart during this process, it could generate a hard light hub with spokes which hold each of the foundation plates in place. However, the self-reduction process was far from perfect and made the original Halos prone to instability and collapse. The newer Halos are capable of safely ejecting segments as well, as long as the process is overseen by a capable enough intelligence such as a monitor. Additionally, small, specifically defined parts of the Halos' terrain (along with the underlying foundation layers) can be jettisoned into space as a precautionary measure against Flood outbreaks. In time, the ecosystems of these ejected sections can be restored by the Halos' automated systems. Halos also possess hard light reinforcement to stabilize and protect them against tidal and gravitational forces from other objects. One of the most extraordinary systems possessed by the Halos (at least the twelve original rings) is their ability to lock entire sections of the ring, or, if necessary, the entirety of it, into reflective slipspace stasis. This suspends these sections in time and renders them invulnerable to damage from the outside, but consumes an enormous amount of energy. Each installation in the final Halo Array orbits a large, dense planet—most commonly a gas giant—which serves as a gravitational anchor. For example, Installation 04 and Installation 05 orbited Threshold and Substance, respectively, which are both large gas giants, while Installation 03 is anchored to a large rocky planet. 343 Guilty Spark, monitor of Installation 04. The installations are designed to be run by advanced artificial intelligence constructs specially assigned by the Forerunners. The highest intelligence on each installation is a single monitor. The monitor's task is to ensure that the installation's Sentinels, which range from Constructors to Aggressors and Enforcers, repair, maintain, and defend the ring from damage, contain Flood specimens, and ensure that their own installation is ready to fire on demand, including running activation simulations. Monitors also have access to their respective installation's defensive system. The Sentinels encompass a broad category of less intelligent constructs which serve virtually any purpose necessary to ensure that the Halo functions properly and are capable of combating small Flood outbreaks. Should a major Flood outbreak occur, heavier automatons, such as the Enforcers and Sentinel Majors will be created. In the meantime, Constructors are also created to ensure that the Forerunner structures on the Installation are kept in optimal shape, and that they are not damaged by conflict or weather. Save for the monitor, all automatons can be constructed at specialized production facilities that float high in the Halo's atmosphere. They seem to have access to copious amounts of materials for constructing an almost indefinite number of automatons. An environment on Installation 05. Although first and foremost designed as weapons of mass destruction, the Halos are also designed as habitats for transplanted lifeforms, including but not limited to humans. After Master Builder Faber's plans were co-opted by the Librarian, the Halos were given terrestrial surfaces to support catalogued specimens. The Master Builder intended to allow these specimens to be infected by Flood forms contained on the rings, and then subsequently terminated in order to test the Halos' effectiveness. The Halo installations support a wide range of environments, habitats, ecosystems, and climates. Installation 04 and Installation 05 supported warm, temperate forests that were both deciduous and coniferous, swamps, and cold, snow covered tundra environments. Installation 00 had climate ranging all the way from tundra, to forest, to desert. While the terrain of a Halo ring may appear to be naturally formed at first glance, it is actually artificially constructed. Strato-Sentinels extract raw materials from the source, process them in transit, and deposit building materials at the Installation. Four huge terraforming factories then move across the face of the installation to "skin" it with landmasses and bodies of water. These factories also hold in the ring's nitrogen-oxygen atmosphere, which is then leaked out to the surface, eventually pouring through the superstructure, and tugged in place by centripetal force; massive walls lining both sides of the ringworld prevent the atmosphere from leaking out into space. The installation's buildings are then built by Constructors and Sentinels. An intricate layer of metallic panels is laid down several meters below the surface of the terrain, upon which rock, soil, and eventually vegetation is added. Slopes, hills and mountains can be created by sculpting these panels. Some features, such as landslides, are the result of time, and have been formed naturally. Others, such as the frigid conditions of the Quarantine Zone or the lake near the Temple on Installation 05 were artificially created. There are also numerous indigenous life-forms that live on the Halos; these were brought on the installations as part of the Lifeworkers' conservation project. The Control Room of Installation 04. Each Halo has several assets that are uniform to all installations. Each contains a control room located somewhere upon its inner surface. The control room houses the installation's mainframe, known as the Core, from which all of the Halo's systems can be operated. The Halo's main weapon can be activated inserting the Activation Index into the Core; on the other hand, the Core may also be used to disable the main weapon. Each Halo also possesses a Library, a large structure protected by an energy shield and a massive wall, where the Index is housed and protected by Sentinels. The index itself is a semisolid holographic representation of the data needed to activate the ring, and can only be directly inserted successfully by a Reclaimer. Installations also possess Cartographer facilities, which contain the complete, real-time record and schematic of the installation, including its inner passages and networks, to be used as a navigational reference for traversing the installation. Flood containment and research facilities are also standard, used by the installation's monitor to conduct research on and observe the surviving Flood specimens; these are protected by Sentinels to prevent an outbreak. Installation 09 exiting slipspace transit. Facilities of the Halo Array contain advanced teleportation grids, allowing instantaneous transportation for a Monitor or Reclaimer to any place on the installation. Under normal circumstances, these grids cannot be accessed by the Flood, though the Gravemind was able to use that of Installation 05 by controlling 2401 Penitent Tangent. For Sentinels, the installation is riddled with tunnel and cave networks for access and transportation. The Halo installations are also equipped with drive engines spaced along their rim. In the event of an emergency, a Halo can maneuver itself to avoid damage from a collision or weaponry. While ideally moved through fixed portals, the rings are able to perform slipspace jumps under their own power. In the case of at least the original twelve rings, a failsafe measure implemented in the event of capture by hostile forces would transition the Halo into slipspace and place it on a collision course with a planet or other celestial body, ensuring the weapon's destruction rather than allowing it to fall in the wrong hands. At the moment of Installation 04's destruction, at least one major fragment of the ring was moved into slipspace, likely as part of a similar failsafe. Installation 05 as it aborts its firing sequence during the Battle of Installation 05. The seven installations in the final Halo Array function via form of lethal radiation designed to kill all sentient life in the installation's three-dimensional radius of 25,000 light-years; when fired in concert with the rest of the Array, this sterilizing effect covers the entire galaxy. When activated, the Halo rings release a burst of cross-phased supermassive neutrinos. The burst possesses a harmonic frequency, which can be tuned to destroy the nervous system of any macroscopic organism that possesses one, even one as rudimentary as a notochord, as shown in the aftermath of a low-powered test firing of a Halo performed by Mendicant Bias in the system of Charum Hakkor. Fine tuning the pulse can also allow for selective extermination of lifeforms with varying degrees of neural complexity. The Halo effect is able to target and eliminate most forms of neural structures, from biological nervous systems to esoteric neural physics constructs, although the effect does not extend to artificial intelligences. Simpler life forms that do not possess a neural system, such as microbes, fungi, algae, mosses, and traditional plants are unaffected. While organisms aboard the twelve older rings were safe from the Halo effect itself due to its directional nature, any sentient being would still experience an uncomfortable sensation in the vicinity of the pulse. Like virtually all Forerunner technology, the Halos are powered by vacuum energy. When the main weapon is fired, vacuum energy is siphoned from local space-time to near-depletion. The pulse of the main weapon is amplified by a series of phase pulse generators and channeled toward the Halo's center. A concentration of energy collects into the hub of the installation, which, when the weapon is fully charged, blasts outward in all directions. The radiation is propelled at superluminal speeds and will eventually propagate at a near-infinite velocity. This was known to generate causal paradoxes when the rings first fired, with two of the Halos reporting pre-echoes of the combined activation before the rings had been fired. Once activated from Installation 00, all installations will cumulatively trigger one another as their radiation fields intersect, amplifying the effects of each individual Halo. The energy discharge covers the Array's effective range and cleanses it of all affected sentient life. Individual Halos can also be fired independently from the rest of the Array; this is known as a "tactical pulse". In the event a Halo's activation is canceled, a burst of energy is fired from the control center into the hub, causing the energy collected there to violently implode, then dissipate harmlessly. The final Halo Array, comprising the six smaller Halos (and the reduced Installation 07) were designed to fire in all directions, within a spherical radius of 25,000 light-years; together, the rings were capable of killing all sentient life within three radii of the Milky Way's center. The original twelve Halos were designed to fire laterally, generating a cone-shaped field with a maximum effective range of hundreds of thousands light-years. When fired from the greater Ark to the Large Magellanic Cloud, the blast was wide enough to cover the entire 14,000 light-year-wide satellite galaxy. The rings could also be fired on a lower power setting, cleansing specific planets or systems within a relatively small area of effect. A creature is killed by the activation of the Halo Array and is instantly decayed by the Lifeworker solvent. The nervous systems of all beings are targeted by the Halos and destroyed, rendering them useless to the Flood; however, the Halo effect does not disintegrate biomass, leaving the victims' bodies mostly intact. Left untreated, lifeforms killed by the pulse will decay in great masses, which could lead to ecological devastation spread by a miasma of rotten biomatter. Therefore, Lifeworkers sprayed target biospheres with a solute that would cause any animal killed by the Array to instantly decay into its component molecules, resulting in flash-desiccation. Due to the Forerunners' use of solute, 21st century paleo-archeological studies gave no indication of the mass extinction caused by the Array's firing. However, in 2332 the Ross-Ziegler Blip revealed a tiny aberration in Earth's fossil records. The only known ways to avoid the effects of the pulse are to seek shelter in a shield world or to escape outside the range of the Array. However, the effects can be nullified by using a ring in an incomplete state. When Installation 08 was fired in an incomplete state, John-117 survive aboard the UNSC Forward Unto Dawn, and native animals on Installation 00 also survived the firing. Flood aboard High Charity also survived the firing, but Installation 00's Sentinels were able to contain those that survived with a containment shield around the ruined structure. Each Halo ring can be activated individually by a Reclaimer, also placing the other installations in standby mode, or they can all be activated simultaneously from Installation 00. In the event of a major Flood outbreak, an installation's monitor will seek out a Reclaimer if available, whom they will enlist to aid them. It will teleport them to the installation's Library and will assist the individual in retrieving the Index. The monitor then stores the Index within its data arrays for safe transportation, lest the Reclaimer fall prey to the Flood before they can activate the installation. Once at the control room, the Reclaimer is given back the Index and must insert it into the Core in order to begin the activation sequence. At any point during the charging sequence, a Reclaimer is able to abort the firing by removing the Index from the Core. Each Halo ring has its own defenses, though Sentinels from Installation 00 are always deployed at a newly constructed ring to finalize preparations to launch it. Retriever Sentinels are also stored inside the rings and will deploy automatically to attack anything deemed a threat. UNSC Pillar of Autumn was initially tagged as a hostile by 343 Guilty Spark using Installation 04's defense system, but was given clearance after scans revealed that humans were aboard. Installation 00 possesses a Sentinel Defense Network, allowing the Sentinels to enact defense protocol around the installation; without the network activated, the Sentinels are unable to perform their duties, except for stationary defenses. The installations in the neoteric Halo Array are numbered in the order they were built in, while their alphabetical designations were assigned in the order in which they were fired, with Alpha Halo being the first ring to fire. Although Installation 07 was originally constructed as part of the first series of larger Halos, it was the last ring to be added to the neoteric Array while being heavily modified to suit its new role, hence the designation. The Halos are remarkably similar to the eponymous megastructure of Larry Niven's Ringworld series. However, Niven's Ringworld encircles a large star, whereas the Halos merely orbit planets, being much smaller than the former. The Halos are also very similar to the Orbitals from Iain M. Banks' Culture series, though considerably smaller. In a Halo: Combat Evolved prototype, Installation 04 had a section that was only partially constructed. This feature was dropped from the final game, though it inspired the design of the second Installation 04. The Prophet of Mercy once referred to the Halo Array's pulse as a divine wind. This is a literal translation of kamikaze, suicide attacks carried out by Japanese pilots against Allied vessels near the end of World War II. Kamikaze aviators were willing to give their lives based on their fanatical devotion to defend Emperor Hirohito and the state. This is mirrored by the Covenant's quest to activate the Halos and commit holy war in deference to their gods. Installation 04 in Halo: Combat Evolved. Installation 05 in Halo 2. The surface of a Halo ring. Installation 08 in Halo 3. Installation 00 sending the Halo Array through a slipspace portal during the Forerunner-Flood war in Halo Legends: Origins. A Halo ring's pulse dimming after its activation. Broken Installation 04 in The Mona Lisa. Installation 04 in Halo: Combat Evolved Anniversary. A visual reference to a Halo ring in Halo 4: Forward Unto Dawn. Installation 03 in Halo 4. Installation 03 ejecting a section of itself in Halo: Escalation. Alpha Shard in Halo: Nightfall. Installation 05 in Halo 2: Anniversary. A post-war human station near an unknown Halo installation in A Hero Falls. Installation 03 in Halo: Spartan Strike. A Halo in Halo 5: Guardians. Alpha Shard in Halo Mythos. Captain James Cutter stands before Installation 04's second replacement in Halo Wars 2. A Halo ring in the menu background of Halo: The Master Chief Collection. The Halo Experience Showcase's unique skybox featuring a Halo ring in Forza Horizon 4. ↑ With only centripetal force the ring would spin around 19 times within a 24 hour period. With this in mind having a simple ground battle would be nearly impossible with the physics involved. ↑ Halo 3, "Terminal Four"
↑ Halo: Combat Evolved Anniversary, "Terminal Two"
↑ 18.0 18.1 18.2 Halo: Combat Evolved, level Two Betrayals, 343 Guilty Spark: "Technically, this installation's pulse has a maximum effective radius of twenty-five thousand light years." ↑ Halo: Combat Evolved, level The Library, 343 Guilty Spark: "Why the Flood is, naturally, simply too dangerous to release, and mass sterilization protocols may again need to be enacted." ↑ 24.0 24.1 Halo 3, level The Covenant, 343 Guilty Spark: "The Ark is out of range of all the active installations!" ↑ "Conversations from the Universe"